Survivor: Redemption Island (2011) - 8th place, 11th out - 5th juror. Voted out in Episode 13, "Too Close for Comfort" (Day 35). Eliminated in a duel (by Andrea Boehlke) in Episode 14, "Seems Like a No-Brainer" (Day 36). Longevity totals: In-game - 35 days; Redemption Island - 1 day. Redemption Island Ep.1 RC/IC: "Push It Uphill" - Pushes blocks, and Ometepe loses. 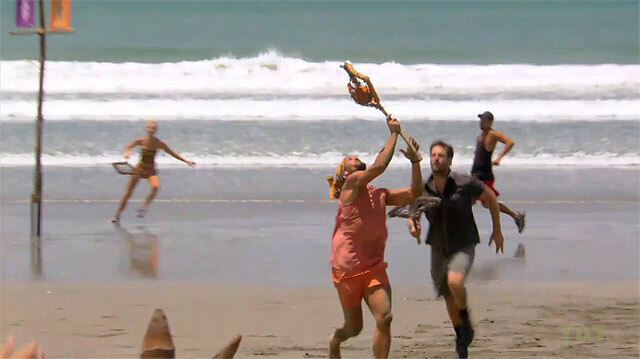 Redemption Island Ep.2 RC/IC: "Smash, Grab, Smash" - Retrieves a key for Ometepe, but again, Ometepe loses. Redemption Island Ep.3 RC/IC: "Spin Cycle" - Turns Ometepe's wheel, Ometepe 'wins' (Zapatera throws the challenge). Redemption Island Ep.4 RC/IC: "Toolin' Around" - Digs and saws, but Ometepe loses. 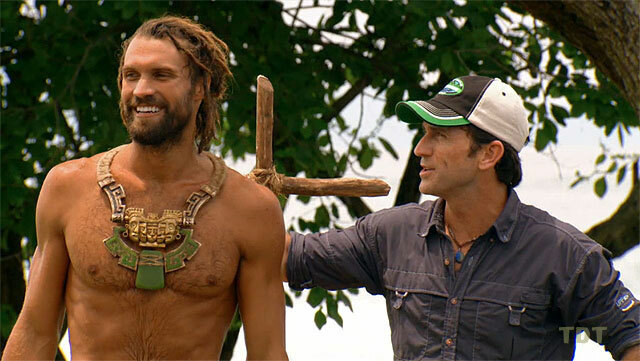 Redemption Island Ep.5 RC/IC: "Smoko" - Blindfolded Grant follows Rob's directions, Ometepe wins. Redemption Island Ep.6 RC/IC: "Beach Balls"- Makes four of Ometepes five catches, Ometepe wins, 5-0. Redemption Island Ep.7 RC/IC: "Crash Course"- Makes at least four of Ometepe's six shots, and Ometepe wins. Redemption Island Ep. 8 IC: "Rollerballs" - Fifth person out, in the three-ball phase (8th/12). Redemption Island Ep. 9 (F11) IC: "Meso Soup" - Reaches the final round, and Grant wins! (1st/11). Redemption Island Ep. 9 (F10) IC: "Gang Hang" - Third person to drop, but at least competed (6th/10). Redemption Island Ep. 10 IC: "Mayan Pizza"- Barely escapes first round, not close in second (4th/9). Redemption Island Ep. 11 (F8) IC: "Log Jam" - Beats Rob, Ashley, and Ralph, and Grant wins! (1st/8). Redemption Island Ep. 11 (F7) IC: "Memory" - With Andrea, eliminated on the 5th card (tie-4th/7). Redemption Island Ep. 12 IC: "Step On It"- Gives Rob a good run, finishes second (2nd/6). Redemption Island Ep. 13 IC: "Bone to Pick" - Not close to the leaders (4th/5). Redemption Island Ep. 14 duel: "A Leg Up" - First to drop out in the final re-entry duel (4th/4). Redemption Island, Ep. 8: Five votes, from Mike, Ralph, Julie, Steve, and David. Redemption Island, Ep. 11 (F7 vote): One vote, from Steve. Redemption Island, Ep. 13: Four votes, from Boston Rob, Phillip, Natalie, and Ashley (voted out, 4-1). Grant scores again for Ometepe! Jennifer Still at Digital Spy (5/18/11): "Grant Mattos (Survivor: Redemption Island)"
Elizabeth Kwiatkowski at RealityTVWorld (5/19/11): "Grant Mattos: Real emotions and feelings are involved in Survivor"
Hobbies: Largemouth bass fishing, surfing and writing. Reason for being on Survivor: It's a huge mental and physical challenge. I want to get to know my true self better. Reason why you think you will be the sole Survivor: I have been through a lot and can push myself mentally and physically."